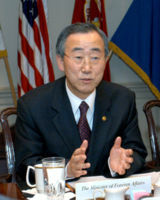 To the United Nations: there is such a thing as 'global law', and it applies to everyone, no exception. Why would anyone be giving you any tax dollars when your organization has never enforced the law and, instead, operated on the basis of the needs of powerful lobbying groups and governments, never from principles of your Charter. 5. Apartheid in the Holy Land, by Desmond Tutu, published in The Guardian, Desmond Tutu is the former Archbishop of Cape Town and chairman of South Africa's truth and reconciliation commission. This address was given April 29, 2002 at a conference on Ending the Occupation held in Boston, Massachusetts, earlier this month. A longer version appears in the current edition of Church Times. 9. No More War by Ed O’Rourke, Countercurrents.org, The terrorists are an insignificant challenge to mankind’s survival. 1. Charging Towards The Big Melt , by Stephen Leahy, published in Countercurrents.org The huge societal shift needed to find ways to live sustainably will likely not happen without some kind of disaster that will generate enough suffering that people will make the shift. 2. Suspended WTO talks likely to bring fresh trouble , by ASHOK B SHARMA, Indian Society For Sustainable Agriculture Indian Express Newspapers (Mumbai) Ltd.
4. Apartheid in the Holy Land, by Desmond Tutu, published in The Guardian, Desmond Tutu is the former Archbishop of Cape Town and chairman of South Africa's truth and reconciliation commission. This address was given April 29, 2002 at a conference on Ending the Occupation held in Boston, Massachusetts, earlier this month. A longer version appears in the current edition of Church Times. 1. Saving Mother Earth. Participants at this year’s Science Congress call for earnest measures for conservation of India’s natural resources, by ASHOK B SHARMA, Indian Society For Sustainable Agriculture Indian Express Newspapers (Mumbai) Ltd.
2. Charging Towards The Big Melt , by Stephen Leahy, published in Countercurrents.org The huge societal shift needed to find ways to live sustainably will likely not happen without some kind of disaster that will generate enough suffering that people will make the shift. 3. Action Alert: Stop the Great Ugandan Rainforest Give-Away, by Dr. Glen Barry , Rainforest Portal and Ecological Internet (EI) Insightful original Earth essays placing environmental sustainability within the context of other contemporary issues including peace and freedom. 1. EU: Climate change will transform the face of the continent , by Michael McCarthy and Stephen Castle , Independent News and Media Limited The Independent Europe, the richest and most fertile continent and the model for the modern world, will be devastated by climate change, the European Union predicts today. 2. Saving Mother Earth. Participants at this year’s Science Congress call for earnest measures for conservation of India’s natural resources, by ASHOK B SHARMA, Indian Society For Sustainable Agriculture Indian Express Newspapers (Mumbai) Ltd.
3. Charging Towards The Big Melt , by Stephen Leahy, published in Countercurrents.org The huge societal shift needed to find ways to live sustainably will likely not happen without some kind of disaster that will generate enough suffering that people will make the shift. 5. Action Alert: Stop the Great Ugandan Rainforest Give-Away, by Dr. Glen Barry , Rainforest Portal and Ecological Internet (EI) Insightful original Earth essays placing environmental sustainability within the context of other contemporary issues including peace and freedom. 6. Climate Change Denial , by Dr. Glen Barry , Earth Meanders and Ecological Internet (EI) Insightful original Earth essays placing environmental sustainability within the context of other contemporary issues including peace and freedom. 1. Suspended WTO talks likely to bring fresh trouble , by ASHOK B SHARMA, Indian Society For Sustainable Agriculture Indian Express Newspapers (Mumbai) Ltd.
2. Apartheid in the Holy Land, by Desmond Tutu, published in The Guardian, Desmond Tutu is the former Archbishop of Cape Town and chairman of South Africa's truth and reconciliation commission. This address was given April 29, 2002 at a conference on Ending the Occupation held in Boston, Massachusetts, earlier this month. A longer version appears in the current edition of Church Times. 1. United Nations Food and Agriculture Organization report: Livestock generate 18 percent of world's global warming pollutants - more than transportation (Go vegetarian) , by H. Steinfeld, P. Gerber, T. Wassenaar, V. Castel, M. Rosales, C. de Haan , Livestock’s long shadow: environmental issues and options This report aims to assess the full impact of the livestock sector on environmental problems, along with potential technical and policy approaches to mitigation. The assessment is based on the most recent and complete data available, taking into account direct impacts, along with the impacts of feed crop agriculture required for livestock production. The livestock sector emerges as one of the top two or three most significant contributors to the most serious environmental problems, at every scale from local to global. The findings of this report suggest that it should be a major policy focus when dealing with problems of land degradation, climate change and air pollution, water shortage and water pollution, and loss of biodiversity. Livestock’s contribution to environmental problems is on a massive scale and its potential contribution to their solution is equally large. The impact is so significant that it needs to be addressed with urgency. Major reductions in impact could be achieved at reasonable cost. 3. Apartheid in the Holy Land, by Desmond Tutu, published in The Guardian, Desmond Tutu is the former Archbishop of Cape Town and chairman of South Africa's truth and reconciliation commission. This address was given April 29, 2002 at a conference on Ending the Occupation held in Boston, Massachusetts, earlier this month. A longer version appears in the current edition of Church Times. 2. Climate Change Denial , by Dr. Glen Barry , Earth Meanders and Ecological Internet (EI) Insightful original Earth essays placing environmental sustainability within the context of other contemporary issues including peace and freedom. 2. EU: Climate change will transform the face of the continent , by Michael McCarthy and Stephen Castle , Independent News and Media Limited The Independent Europe, the richest and most fertile continent and the model for the modern world, will be devastated by climate change, the European Union predicts today. 4. Climate Change Denial , by Dr. Glen Barry , Earth Meanders and Ecological Internet (EI) Insightful original Earth essays placing environmental sustainability within the context of other contemporary issues including peace and freedom. 8. Climate Change Initiatives are Heating Up in the United States, by Jamiyo Mack , with courtesy of Air & Waste Management Association (A&WMA), published by Environmental Expert S.L. 4. How to organize the human Community for World Government, by SAK, "sabz ali yusufzai", , How to organize the human community to globalize it for changing the present idle UN into an efficient Democratic World Government? 3. Suspended WTO talks likely to bring fresh trouble , by ASHOK B SHARMA, Indian Society For Sustainable Agriculture Indian Express Newspapers (Mumbai) Ltd.
1. Action Alert: Stop the Great Ugandan Rainforest Give-Away, by Dr. Glen Barry , Rainforest Portal and Ecological Internet (EI) Insightful original Earth essays placing environmental sustainability within the context of other contemporary issues including peace and freedom. 5. Climate Change Denial , by Dr. Glen Barry , Earth Meanders and Ecological Internet (EI) Insightful original Earth essays placing environmental sustainability within the context of other contemporary issues including peace and freedom. The Editor of the Global Information Media is now accepting articles, letters, reports, research papers, discussions and global dialogues, and messages for publication. This Media is a way to communicate workable sound solutions to problems arising in the world. Let us share our problems and workable sound solutions. Sharing information is a necessity to all life and humanity's survival. Our world is changing fast before our eyes, and we must react quickly and hard to protect all life on Earth. No hesitation! Right now and no waiting! Life on the planet is our first priority. We must protect it at all costs. We, global citizens, fight to protect life on Earth for this generation and the next ones. We are the defenders of the environment and the global life-support systems. We know who the beasts are, and how they destroy the living on our planet. We have rallied together all over the world to protect our home, Earth. But this time we are not alone. We know it all! We know how everything works. And we will do whatever it takes to protect life on Earth. "We the Peoples", the Global Community, the GCEG, are the Earth revolutionaries, and we will protect life on Earth at all costs. 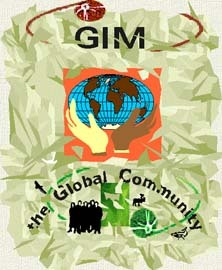 This is the main index for the Global Information Media (GIM) concerning activities of the Global Community. Societal family image aspects and issues. Our overpopulated planet aspects and issues. All fourty four sections may contain any of the following information: abstracts, research papers, notes, outlines, posters, articles, letters, press releases, reports, and newsletters. They may also contain discussions, global dialogues, brain-storming exercises on issues, or just email messages from interested participants and groups. Just so you all know we don't pay anyone, and we don't pay expenses. We do volunteer work for humanity. We expect volunteers to be responsible and accountable of all their actions. We do soft activism work. The Global Constitution shows us how to operate our organization. We follow Global Law as shown in the Global Constitution. All those who do volunteer work for us must become familliar with it and become 'global citizens'. We want our volunteers to be completely loyal to the Global Community and to the values and principles we promote. The Editor.